In 2006, My dad wrote his ‘musical memories’ — a memoir of his life in music. The memoir was published in DUET, a publication of the Twin Cities Musicians Union Local 30-73. This excerpt from the story covers the Korean war years. At left is a picture of the band taken in Wurtzburg, Germany in 1952. My dad is in the first row, second from the right. I was drafted into the U.S. Army at the beginning of the Korean Conflict in 1951. On the information forms I answered yes to playing a musical instrument (even though I had not touched my sax or clarinet for two years). I left on November 20th (one day after my 21st birthday), first to Ft. Sheridan, IL by train, then for eight weeks doing US Army Basic Training at Ft. Knox, Kentucky. While marching up “Devil’s Hill” during Basic Training, I can still remember hearing the Drill Sergeant saying; “Dig in Schneider!”. Basic training was then followed with eight weeks at the Fort Knox Music School. Towards the end of training, we constantly were worried about being sent to Korea as we heard that a whole band was wiped out in a combat zone. Fortunately on completion of music school in April, 1952, I was assigned for duty in West Germany. Again we left by train for the East coast, then boarded an Army Troop Ship. After 12 days by troop ship we arrived in Bremen, Germany then transported by train to a city in southern Germany called Sonthofen for final assignment. The troop ship ride to Europe was somewhat boring except for playing in the ship’s band. It was also sort of fun in deriving methods of escaping other duties aboard ship like cleaning the ship, painting, and other undesirable tasks. Most of the time we would hide out in an unoccupied latrine (dozens of toilets in rows without any privacy). As the ship rolled so would the rows of toilets dump their contents vertically? The ride on the train was miserable with fold-down bunks, two high but being so crowded, all we could do was sit on the bottom rows for the ten hour ride. On arriving in Sonthofen, I was given another audition, failed and was sent for further music training at the European Band School located in Dachau (of all places; a German Concentration Camp). Musically this was the best thing that happened to me, as the instruction lasted four months. We had some of the best German instructors, mostly professors, had music theory and composition, lessons, concerts by the staff alternating each Friday between orchestra (strings) and band (wind instruments). The concerts were always followed with student assignments of analyzing and writing on the orchestral performances. Being only 21 years old at the time, the history of what happened in Dachau did not sink in until later in life. All of our training, sleeping quarters, dining facilities, and other needs were in one building formerly occupied by the German SS Troops. We even had waiters in the dining room. I believe the object at that time after WWII ended, was to provide jobs for the Germans. With Munich being so close we had an opportunity to sneak over a fence and go see this city. Train fares were still free for military personnel at the time. Dolores and I tried visiting Dachau in 1992, but missed out due to the camp being closed on Wednesdays. Final assignment after training was being assigned to the 31st Army Band on an Army base in Wurtzburg, Germany. 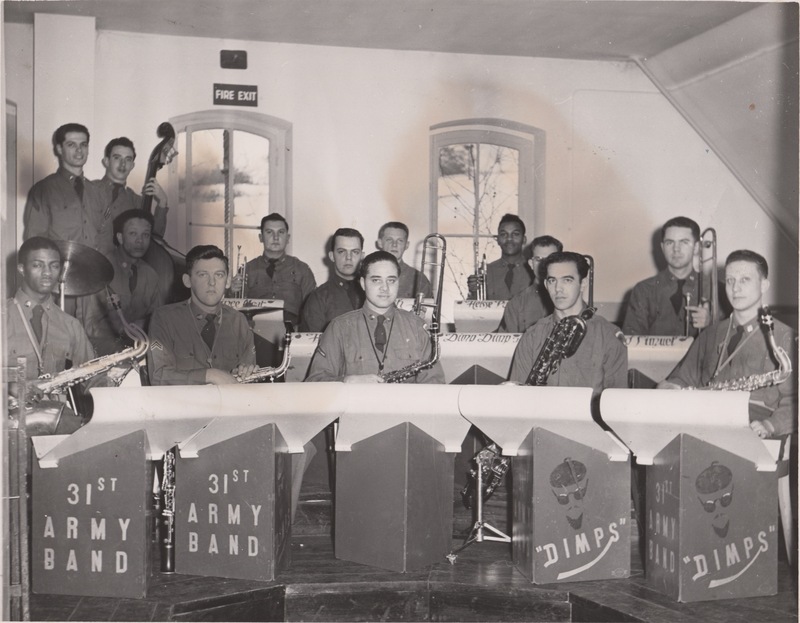 This band was originally all black and with the army beginning to desegregate, I was among the first small group of ten whites assigned to this band. For the first few weeks, we would hear jazz groups playing up in the rehearsal room into the wee hours. This band needed a Baritone Sax player, so I was assigned this instrument which I played for concert and jazz bands and clarinet in marching band. Our duties covered playing for military parades/reviews at various Army bases in central and southern Germany, concerts in small German cities, Army service clubs, non-commissioned officer’s clubs, and officer’s clubs (for which we received extra pay). The citizens in these small cities just loved our music as it probably was their first experience in listening to live American music. Our current commanding officer left for another assignment and was replaced by one we secretly called “Porky”. More on him later*. Since the band was quite small, we were required to learn an additional instrument to broaden our scope. With an acoustic bass violin lying around in the supply room, I choose this instrument.. A teacher was brought in (German) to provide me with lessons. This lead me to playing bass after leaving the Army. Besides learning bass, I provided him with American cigarettes. We also had an occasional beer to go along with lessons. Beer was easily provided by Sam, one of our alcoholic percussionist and career rank of Army Private. His sleeves, where rank is normally sewn, were frayed from being promoted to corporal than back to private over his time in the army. Sam had beer hidden all over the building. We called them Sam’s eggs. One time while doing a half-time show at a local Wurtzburg football game, one of our routines was for the whole band to reverse directions and continue down the field in the opposite direction. With drums normally in the last row, Sam was now in the first row and he did not hear a command to reverse so he kept going in the opposite direction all by himself. He was out about twenty yards out until he finally heard us yelling; “Sam!” He came running back in formation with his drum still on his gut. I guess it was unplanned entertainment for the football fans. *This Warrant Officer, we called “Porky” (had a wife living off base), also had a German girlfriend on the side. During performances at different bases, we knew he would get nervous when knowing a base commander officer was present, we would purposely play quietly to get him mad. When he sensed this while directing, he would say “play you ‘sons of $#@&%, play”. I bought a small used motorcycle and started on a trip to Italy which began with one of the percussionists in the band (fortunately he was a history teacher before being drafted into the army so he set up our itinerary). The Germans told us we were crazy (in German; Verrückt!) to go through the mountains with such small motorcycles. My cycle continued to overheat due to excess carbon from bad gasoline and overheated brakes while going down through the Brenner Pass (Austria to Italy). This pass was really scary. We decided to ship both bikes back to Wurtzburg and continue touring Italy by train. Trains were still free to American troops in Europe after WWII ended. We visited Florence, Venice and many other cities on the way to Rome. I remember in Naples being approached by a man who recognized us as GI’s, opened his coat saying “Hey, GI, want to buy a watch? His coat was lined with watches. We even got to Pompeii (very few tourists there at the time) which was very close to Naples. This was the beginning of my interest in European history and still continues today. 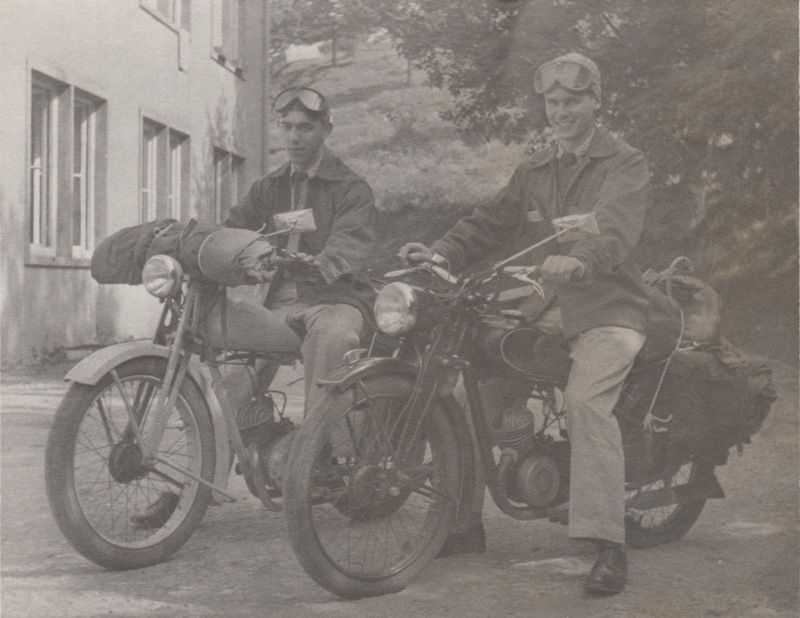 On returning to Wurtzburg, I had the motorcycle repaired for one German Mark (25 cents at the time). This entry was posted in Uncategorized and tagged army, father, memoir, musicians, writing. Bookmark the permalink. ← Musician First-Class – Thanks!